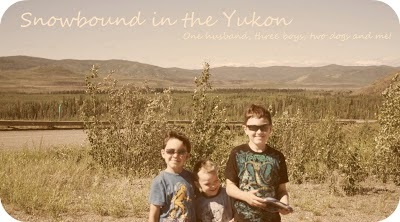 Snowbound in the Yukon: Here we go! I got the called yesterday afternoon and have been busy ever since. Buddy and I are leaving Sunday, on Monday he has preliminary appointments and Tuesday he'll have the surgery. How is that for efficient? I'm not sure how they fit us in and I"m glad they did but the weather. Yes, the weather! It's supposed to finally warm up to -35C onMonday but the low is still -45C. So I'm hoping, hoping it will warm up faster for tomorrow. Oh please! It's a 7 hour drive or more for me in the winter because of the roads and my children with me, I drive pretty much the speed limit and I want leeway if anything happens so I can't wait until Monday to leave with the appointments at 2pm, I'd feel rushed and we'd have to leave at 6am. My brother is coming with me for support and help. Hubby is staying home with the other two boys with my Mom for backup when and if it snows. I think we are pretty much set! I'm going to make sure the van is fully stocked today with blankets, extra fluids for the van and us and other essentials! I'll be thinking of you on Sunday, Monday, Tuesday! And of course the ride home!